Students for a Democratic Society (SDS) was, historically, a student activist movement in the United States that was one of the main iconic representations of the country’s New Left. The organization developed and expanded rapidly in the mid-1960s before dissolving at its last convention in 1969. 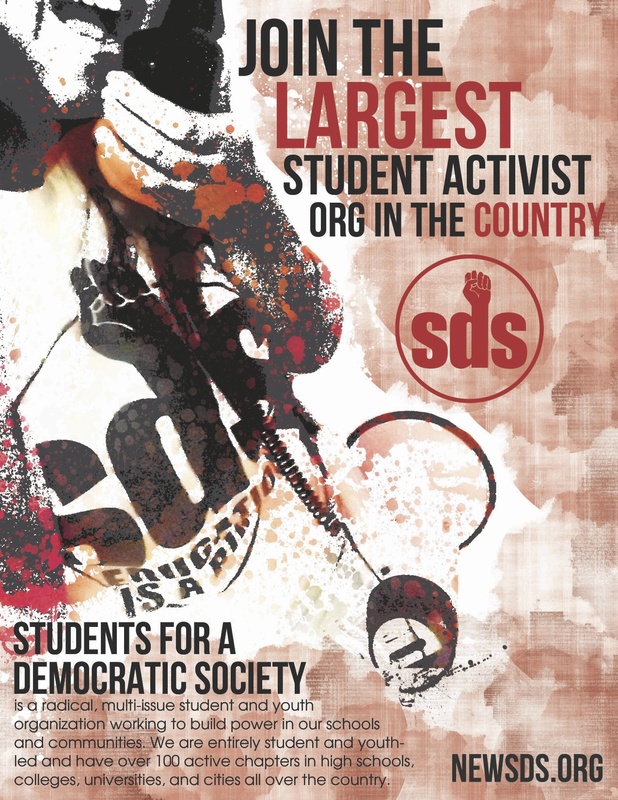 SDS was the organizational high point for student radicalism in the United States and has been an important influence on student organizing in the decades since its collapse. Participatory Democracy, direct-action, radicalism, student power, shoestring budgets, and its organizational structure are all present in varying degrees in current national student activist groups. Though various organizations have been formed in subsequent years as proposed national networks for left-wing student organizing, none has approached the scale of SDS, and most have lasted a few years at best. Who We Are … Students for a Democratic Society is an organization of progressive young people. We seek to create a sustained community of educational and political concern; one bringing together liberals and radicals, activists and scholars, students and workers. We maintain a vision of a democratic society, where at all levels people have control of the decisions and resources that affect their lives. SDS at the UMN is a multi-issue organization, though our current emphasis is on educating, organizing and mobilizing a strong grassroots movement to end the occupation of Iraq, Afghanistan, and Palestine.